May 24 , 2018 —A gorgeous spring evening welcomed 378 graduates and their families to the 51st annual Middlesex Community College commencement ceremony on Thursday, May 24. 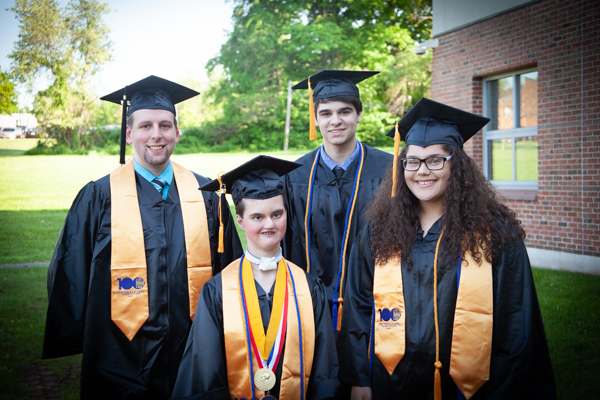 Held outside on the scenic Middletown campus, the college awarded more than 407 degrees and certificates, including 29 students who earned more than one degree or certificate. Among the Class of 2018 were 22 veterans, 25 foreign/international students, 148 males, and 230 female graduates. The oldest graduate was 70 years old, and the youngest was 17. The most persistent student began classes at Middlesex in 1986 and attended on and off during the next three decades before returning in 2016 to finish the necessary requirements to graduate. The ceremony (see full video of ceremony here) was also the first one presided over by Steven Minkler, PhD, interim campus chief executive officer and dean of academics. Dean Minkler began his new role, under the former title of lead campus administrator, a year ago. Dean Minkler also announced the college will award 20 associate degrees to incarcerated graduates in a separate ceremony. This Second Chance Pell grant program is in partnership with Wesleyan University. Julé Crawford, chair of the MxCC Foundation, and Merle Harris, PhD, of the Board of Regents for Higher Education, also offered greetings and congratulations. James Lagace, originally from Meriden and a business administration major with a 4.00 grade-point average, was presented as the Class of 2018 valedictorian. This fall, Lagace plans to further his studies in finance at Quinnipiac University in Hamden, Conn.
Christopher Kukk, PhD, whose books are based on the idea of weaving values such as compassion into learning, civic, and business communities, told the graduates in his commencement address to “live life as passionate achievers.” Kukk is the founding director of the Center for Compassion, Creativity and Innovation, and professor of political science/social science at Western Connecticut State University in Danbury. Class valedictorian Lagace received the Award for Academic Excellence which was presented by Dean of Administration Kimberly Hogan. This award is given to graduating students who have achieved a cumulative GPA of 4.00 and who have completed 50 percent of their requirements at Middlesex. Michael Pazareskis of Wallingford and Lagace received the Pritchett-Taylor Scholarships presented to them by Associate Dean of Development Cheryl Dumont-Smith. These scholarships are awarded to the graduates with the highest cumulative GPA who have earned at least 30 credits at MxCC, and who have attended full-time for at least two semesters. President Ojakian, Dean Minkler, and Harris conferred associate degrees to students in 31 different areas of study, including the first students to graduate with CSCU Pathway Transfer Degrees in communications, social work, and theater. With this transfer program, students can complete associate degrees that seamlessly transfer as juniors to any CSCU four-year college offering their major. Certificates were handed out to students in eleven areas of study. During the ceremony, retiring business professor Nancy Kelly received professor emeritus status conferred by Dean Minkler. Professor Kelly has served Middlesex for more than 34 years and led the commencement procession as the college marshall. Outgoing library director Lan Liu was also named librarian emerita for her dedication as director of MxCC’s library services and the Learning Commons. Sharon Griffin and her husband Bill, of the Peach Pit Foundation in Durham, were recognized with the Distinguished Service Award for their work with the MxCC Foundation and by providing opportunities to members of their community who exhibit a desire to improve their own circumstances and work hard to achieve their dreams.